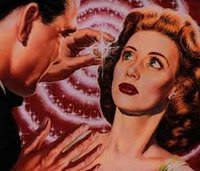 Somebody once tried to put me into a hypnotic trance back in university, but it didn't take. I don't know if my steel-trap mind was just too overpowering or if she was, in fact, a sub-par hypnotist. She did have a lovely soothing voice though, and I recall being very relaxed by the end of the session. I did not, however, cluck like a chicken nor sing My Heart Will Go On. After being shamefully absent for the past five years, the Spousal Unit and I are making an appearance at his company Christmas bash this weekend. In addition to the glass-in-hand small talk, trying to remember that guy's name, the ubiquitous slices of roast beef, and the inevitable classic country-rock dance floor selections, there will also be some after-dinner entertainment in the form of a hypnotist. This is not unprecedented; there was also a hypnotist who performed at the company Christmas party some ten years ago, which yielded some satisfyingly cringe-worthy results. This year I am hoping for some picture-perfect Jersey Shore moves and perhaps some yodeling. I have seen one live once, and it was pretty entertaining. I don't think I'd take to it, either. I don't have patience. A couple double scotch and it'll be fun. I would never ever allow myself to be pulled on stage by a hypnotist. I like to think I'm a non-believer in such hocus-pocus but at the same time I don't want to test the theory only to find myself doing crazy erotf things on stage worthy of a youTube posting. Classic country rock? I'm in! Why don't you pretend to be the hypnotist? Company Christmas parties: The mother lode of awkwardness! One would have to sit still for an inordinate length of time, Lesley. I don't have the patience either. I will keep that suggestion under advisement,Mr Anchovy. It would make most things fun. I'll see what I can do,Kelly. Or maybe I'll just post a picture from the Christmas party a dozen years ago, since I will be wearing the same dress. That's my underlying fear also, Toccata. I prefer to maintain my attitude of smug superiority about the whole business. Why don't you and your lovely wife drive down and join us at the Christmas party, John? I will pretend to be the hypnotist and will drag you up on the dance floor for Thank God I'm a Country Boy. Since I am generally the designated driver, I get to watch all the awkwardness as it happens, Flannery, plus remember it the next day. Wow, that is really early for a company Xmas party, but it is that time of year and I know from experience there are a lot of places jockying for Xmas party venues, catering, etc. in a small space of time. Ugh, the music selections at Xmas parties...DO NOT get me started! You'd need to hypnotize me to not go nuts! I was thinking it's a bit early for a Xmas party too, best get it out of the way now. We have our the first week of December - pantomime, again! I actually have hopes that the music will be somewhat better this year, WC, as there are a lot more youngsters in the company now. They can't all be Kanye West or Taylor Swift fans, although I would welcome a dance off between the two factions. I would rather have the party now before the insane season starts, Al, especially since the roads are currently bare and dry. Alas my parents are visiting over the holidays. But I'll brush up on my jug playing for the next hoe-down.